I’ve been struggling with breakfast for a while…. Trying to get my protein in and still enjoy something like bread. Here’s my solution…. 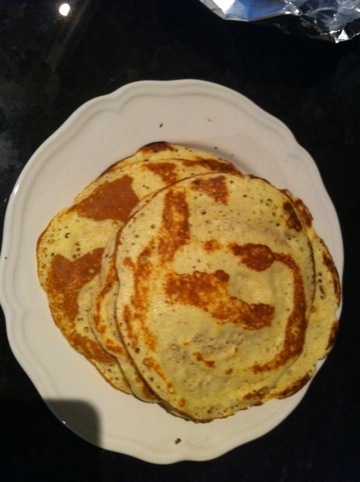 The Dukan pancake thing for breakfast is nasty! I can’t stomach it….so I adapted it to the following and now it’s amazing. I make the “pancakes” smaller and I can get about 3 out of this batch. Now every morning breakfast is 3 pancakes, 1 fruit flavored yogurt, 1 tbsp fat free/sugar free whip cream for the pancake and low fat/ no sugar strawberry jam I purchased at Zarky’s, a cup of coffee and I am a happy camper! Dukan with a BIOS LIFE SLIM back up!